Builders Emporium at Mystic Darkstone Design is dedicated to bringing you builder's edition items for you to use in your own in-world creations. All items for sale in this region are either copy/transfer or mod/copy/transfer. Here at the Builder's Emporium we hope to provide an environment for content creators of Virtual Worlds to come together to share and educate one another. No matter what Virtual World you favor there is something to be said about the joy of creation. You are limited only by your wildest imagination and a few scripting limits. Want to create that Bustling City? Cozy Home? Hobbit-like Hole? Summer Dream? A Fantasy Forest? Wondrous Winterland? or do you have a dark side, one that can only be satiated by the carnage of fires, smoke or blood? The Classes presented by the Builders Emporium at Mystic Darkstone Design will walk you through the beginning level classes to help you get started. Once the basics are mastered the Classes will take on a different side, not usually presented in Virtual Worlds, to help you hone your skills and advance your knowledge base. There will be group building sessions where you will work with others on selected creations or environments. The Group Creation Classes will also feature monthly contests and issues prizes for the most creative. Soon there will be a download section here exclusively for those who attend classed in the Virtual World of Island Oasis to obtain something new each month for FREE. 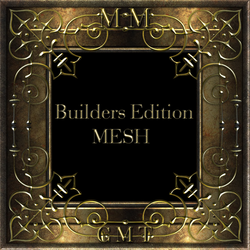 Freebies may include Textures, OpenSimulator Based Scripts, Sculpt maps, Sounds, xml files or other items to assist in bringing your creations to life. Permissions on the FREE items will come with a Commercial Use License* for content creation on any grid. You only need to register the file(s) you have downloaded for your license to be active. Details provided on the download page. READ full TOS in store and in product packaging. Violation of TOS will be seen as theft and will be acted upon accordingly. Submit questions to Customer Service.